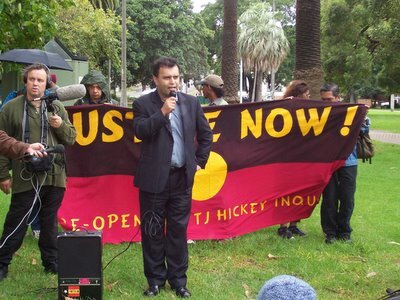 As promised, I will begin a series of posts on links between two key Green Party MPs, Keith Locke and Jeanette Fitzsimons and the Australian Marxist-Leninist organisation, the Democratic Socialist Party. Probable future Green Party co leader, Russel Norman was once in the DSP and wrote several articles for its paper, Green Left Weekly from at least 1994 to at least 1999. Locke and Fitzsimons separately and possibly add some further backgrounders. Matt McCarten has long had the dream of building a party of the "working class", to the left of Labour, to shake up the power structures of this country. To this end, he has collaborated, for at least 15 years with the Australian Democratic Socialist Party, who have long worked towards for a similar organisation in Australia. The DSP was led by two brothers, Jim and John Percy. Jim Percy died of cancer in late 1992. Green Left Weekly, No 80 of November 1992 carried messages of condolence from communist and socialist activists from all over the world. Several letters came from NZ, including from Jim Anderton, Keith Locke and Matt Robson. Matt McCarten, writing as President of the NLP and Chairman of the Auckland Alliance Party had this to say. "I valued my friendship and political collaboration with Jim. He gave me the theoretical base for my political work. I owe so much to him. The impact Jim had on me over the last few years was enormous. Jim was one of the few left leaders who was able to bring Marxism-Leninism alive into todays world. He made socialism relevant to those of us who seek a new society based on social justice. His socialism was inclusive, warm and exciting. He was the major political influence in my life." In January 1993, (GLW No 84) McCarten was guest speaker, on the Alliance Party, at a DSP organised Socialist Activists Education Conference in Sydney. Malik Miah, a San Fransisco based member of the US Committees of Correspondence was also a guest speaker. The CoC was formed in 1992 and comprised of a large breakaway group from the Communist Party USA (including the notorious Angela Davis) and a mixture of Trotskyite, Socialist and Maoist Groups. The CoC was attempting to build a "Third Force",in US politics, similar to the Alliance party in NZ. That same year, McCarten gave a speech in San Francisco on the Alliance Party, which was reprinted in GLW No 107. In Easter 1994, the DSP organised a major "Green Left" international conference in Sydney, attended by around 800 people. Attendees were virtually all Marxist-Leninists or Greens and included Keith Locke, Jeanette Fitzsimons and I believe, Matt McCarten. The conference's main purpose was to launch a new international magazine called "Links". range of activists and concerned individuals to discuss and debate the ecological and social problems currently facing the world. During the meeting, a new international discussion journal, "Links", a quarterly magazine for socialist renewal, was launched." Explained "Links" editor Peter Boyle "The range of groups involved in "Links" is proof of a new climate of collaboration in the international left, This is a project involving the left from the Communist Party, the Trotskyist, Maoist, ex-Social Democratic, independent left and liberation theology traditions. We all have in common a desire for socialist renewal based on support for democracy, feminism, ecological sustainability and internationalism." The "Links" editorial board included; Jeremy Cronin, a leader of the South African Communist Party and editor of The African Communist; Langa Zita from the SACP and the South African Metalworkers union; Baddegama Samitha from the New Socialist Party of Sri Lanka; and leading members from the New Zealand Alliance, the Sandinista National Liberation Front, the Farabundo Marti¡ National Liberation Front and the Fourth International. Matt McCarten was on the Editorial Board and Keith Locke wrote an article on the Alliance Party for the first issue. In 1998, according to GLW No 302, McCarten again "crossed the ditch" to attend a DSP organised conference "150 Years of the Communist Manifesto". In 1999, McCarten was Still on the Editorial Board of "Links" with Andre Brie of German Party of Democratic Socialism (the former East German Communist Party), Max Lane, Doug Lorimer and John Percy of the DSP, Jeremy Cronin and Langa Zita of the South African Communist Party and Carl Bloice, Malik Miah and Joanna Misnik of the CoC. In 2000, McCarten attended the DSP's "Marxism 2000" conference. He spoke on "New Zealand: the Recent Experience and Perspectives of the Alliance." The same year, the March 1st issue of "The Guardian" (journal of the Communist Party of Australia) published this editorial. "Left Unity, Progressive Unity It's Time!" "The Progressive Labour Party under the title of "Towards a Progressive Alliance" convened a one-day conference of progressive parties and community groups in Sydney last weekend. It brought together representatives of a number of political parties and community organisations, including some trade unions. Matt McCarten, Director, NZ Alliance Party attended and spoke of the New Zealand experience and while warning against simply attempting to copy the NZ "model" advanced some excellent principle on which to build relationships between different organisations." After the collapse of the Alliance Party after the 2002 elections, McCarten turned to other groups to further his dream. For a while he worked with the Maori Party, but soon quit. He then began building aovement called the Workers Charter Movement, as the basis for a new mass based political movement. The WCM was based around the Socialist Workers Organisation (and its front, the "residents Action Movement") elements of the Greens and Maori Party, the "Unite" trade union, the late Bill Andersen's, Socialist Party of Aotearoa and John Minto and Mike Treen's, "Global Peace and Justice, Aotearoa". Meanwhile in Australia in 2001, the DSP had set up a nationwide wide "Socialist Alliance". The SA was made up of several parties, including Workers Power, the Freedom Road Socialist Party and the Communist Party of Iraq (in Australia). The DSP was by far the biggest group, followed by the International Socialists, sister party to NZ's, Socialist Workers Organisation. Links between the Socialist Alliance and Workers Charter activists have been extensive and ongoing. I quote this report from GLW of an Easter 2005 DSP organised conference held at Sydney Boy's High School. "Among the most exciting developments discussed at the Asia-Pacific International Solidarity Conference held in Sydney at Easter was the rapidly changing map of New Zealand politics, in particular, the development of the Maori Party, the UNITE union and the Resident Action Movement. Several left-wing leaders from New Zealand attended the conference, including Matt McCarten, who was until recently the campaign manager for the Maori Party, Global Peace and Justice Auckland leader Mike Treen, and Dave Colyer and Grant Morgan from NZ Socialist Worker, who all addressed a feature session on March 28.". McCarten was a guest speaker as was Srilata Swaminathan, Communist Party of India (Marxist-Leninist), Ahmed Shawki,of the US International Socialist Organisation, Ali Kazak, head of the Palestinian delegation to Australia, (former PLO rep in Australia), Leonel Vivas, ambassador for Venezuela and Malik Miah, trade union and Green Party activist, USA.